Willie “Bill” Wilson was born on January 31, 1948. He transitioned into eternal rest on Wednesday, December 13, 2017 at Carolinas Hospital System, Marion, South Carolina. He was one of nine children born to the late Virginia Johnson Wilson and Kinslar “Buddy” Wilson. “Bill” as he was affectionately called attended the public schools of Marion County, South Carolina and graduated from Johnakin High School in 1966. After graduation he served in the United States Army. Bill returned home from the military and had various jobs until obtaining employment at the Marion Animal Hospital, where he was employed for forty years. 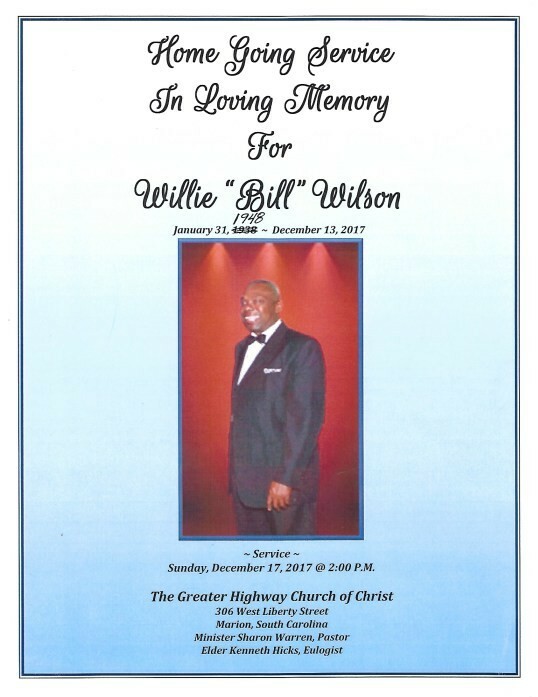 It was because of that love for animals and his love for the color blue that penned him the nickname “Doctor Blue.” Willie was also employed for ten years as a bus driver with Marion School District One. Bill remained in Marion and met the woman that he would later marry. Bill met Lillian Jones in 1980 and they were married in 1982. To this union one child was born, Dave Kinslar Wilson. Bill was a hard worker at his employment and at home. He was constantly doing what he saw as needed in the house and yard. He always said that he wanted his family to be comfortable and what he did not earn from the hospital and school, he earned with his other natural gift, cooking and bartending. He bartended and prepared food for many of the locals in Marion County along with assisting with many wedding receptions, parties and celebrations. He was known as a jack-of-all-trades. Bill showed his culinary skills at home. It was a rare occasion that Lillian had to prepare meals. He was a man that loved his parents, siblings and family. He paid special attention to his parents and really catered to them. He assisted his mother with home ownership, once bought his mother a car and always shaved his father due to his blindness. He would call his sisters if the weather forecast was not favorable to see if they had what they needed to make it through the storm. He would go to each of their homes to make sure they had water, food and heat. He also loved his brothers and assisted his sisters with caring for an older brother by bringing him to our home where he remained until his death. In his latter years he behaved as though he were Donnie’s dad and husband to Celia Mae, Rosa Mae and especially Dot Lee who I called his sister wife. Those nieces and nephews were included in the love also. Janice once drove him to Columbia for a procedure that he needed, Felisha was his pet, Gary was special, Kevin was his auto mobile nephew and Michael, David and Kenneth were his other children. Bill was preceded in death by his parents; siblings: Sammie Wilson, Ernest Wilson, Mary Smith and Miriam Godbolt. Bill leaves to cherish his memories ~ his loving wife: Lillian Jones Wilson; four children: Dave K. (Jennifer) Wilson, Tirrell Hughes both of Marion, SC, Willie Hughes of Bennettsville, SC and Tonya Williams (James) Dewitt of Maryland; four special children: Sonia Hughes Cross, Anthony Hughes both of Columbia, SC, Thomas Hughes of Myrtle Beach and Geraldine Pierce of Delaware; four siblings: Dorothy Moses, Celia Legette, Rosa (Jerome) Woodberry and Donnie (Sallie) Wilson all of Marion, SC; three special sisters: Betty (Walter) James, Emma Lee Graves, Beatrice Williams all of Marion, SC; his special friends: Theodore Williams, Bobby Hughes, Mitchell Lee Bacote, Thomas Perry, Bernard Gerald, Clarence Isreal, Joe Sanders, Willie “PY” Grice, Willie “Jhoney”Rogers, Isaac Wilson, Gene Stanley, Nate Stanley and a host of other nieces, nephews, other relatives and friends.